The Daily Herald (give it up for my hometown newspaper!) has a story on a Japanese school, Futabakai, smack dab in the middle of Arlington Heights, a suburb of Chicago. Much like The American School in London does for U.S. ex-pats, Futabakai offers an opportunity for Japanese kids temporarily living in Illinois to receive the same education they would get at home. And once they return to Japan, they won’t have to scramble to catch up with their peers because they’re all on the same page. The story got me thinking about the Nova scandal last November. 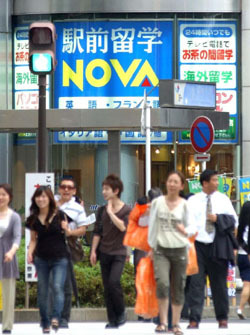 Since the big bankruptcy, many teachers who lost their jobs stayed in Japan to work for Nova’s replacement, G. Communications, but it hasn’t been easy. Amid rumors and rumblings all year that Nova Language School in Japan was on the brink of bankruptcy, word comes that the ubiquitous chain has closed, leaving thousands of foreign teachers in the lurch (not to mention hundreds of thousands of paying Japanese students). American, Australian, Canadian, Irish, New Zealand and British visitors living and working in Japan while teaching English now have nowhere to go (Nova set up their apartments and deducted rent from their monthly salaries) and no way of recouping their losses or extending their work visas. Complaints about late payments and poor job training had dogged the company for months, if not years. Japanese students who wished to cancel their classes found themselves locked into long-term contracts that supposedly couldn’t be broken. Some estimate Nova’s debt at ¥43.9 billion, but having filed for bankruptcy on October 26, the company is seemingly court-protected from lawsuits both inside and outside the country. According to an article in the Christian Science Monitor, “…Nova grew too big, with nearly half the market.” Known in some circles as “McEnglish”, Nova was founded in 1981 but didn’t become aggressive about expanding its offices and overall presence until the late 1990s. 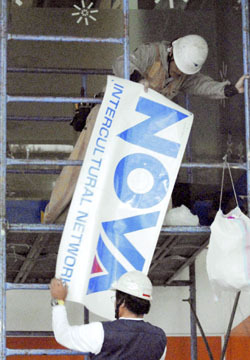 Starting in 1997, the brand was everywhere, and Nova became Japan’s biggest conversation school (or eikaiwa), responsible for the livelihood of 7,000 foreign teachers. Not all of them were English-speakers. Many people were hired to teach French and Chinese, as well. It’s unfortunate that Nova is making eikaiwa look bad right now. I did find a website, The Greenlist of English Schools, that offers “a comprehensive list of good schools to work for” in Japan. Also, English First, a private education company, is apparently offering relocation assistance to teachers throughout the month of November.